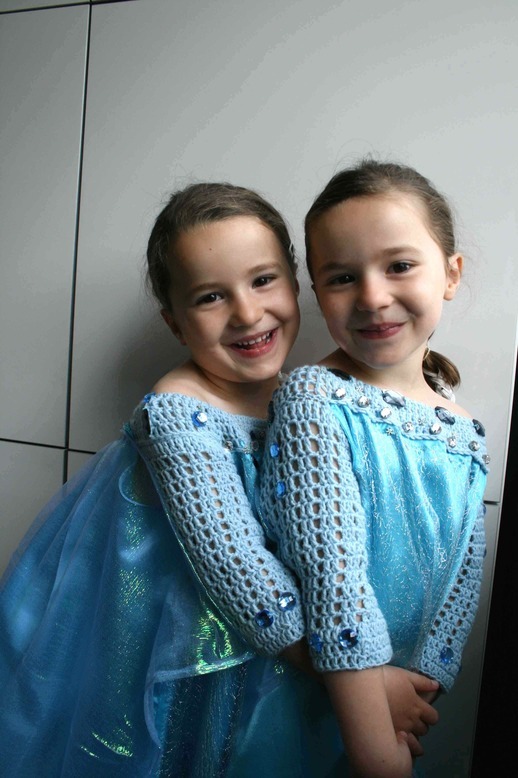 Well as a parent of two little girls there wasn’t going to take too long before I was asked to make two little Ice Queen dresses!. As any 5 year old, they adore Frozen from Disney and it has been impossible to get the dresses from anywhere! someone really messed up on the merchandise. 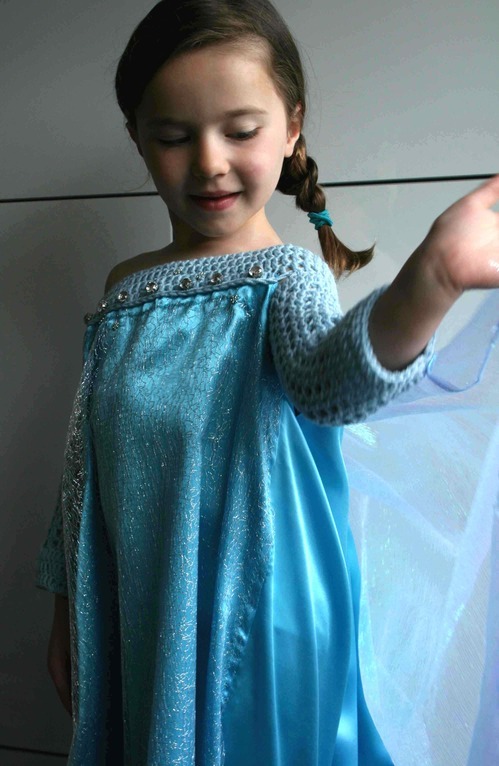 I decided I will make a couple of Ice Queen dresses, I didn’t want to make them like Elsa, my point of view is that she is an young woman and she looks it!, my little girls and 5 so I thought a traditional princess cut dress is more appropriate. Anyway these are my monkeys wearing them just before going to a birthday party (it wasn’t a costume party but who was going to get the dresses off them??? ), they had a great time and I had a few mums asking me to make them for their little ones, I felt so bad saying no, but really who has the time?, I was sewing the stones on the dresses the night before till late! It didn’t take long until the ‘photoshoot’ became something else! I bought 3 meters of the satin style fabric for the body, plenty! I had about 0.5 meters left over. 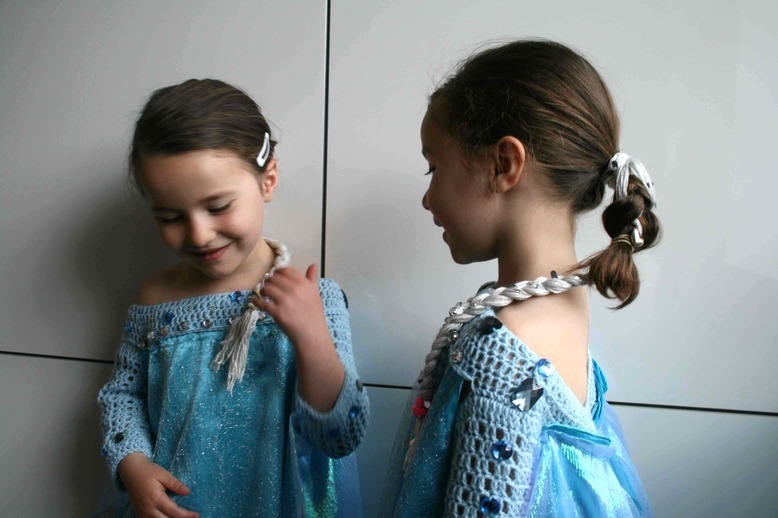 I added a VERY last minute white/silver plait to their hair with the yarn left from the Design Wars challenge project. The materials were quite cheap, I made each dress for a grand total of £5.75! (around $8 or $9). Anyway I am just going to give you a general way of making them, as I was on a timer and I could not take pictures of the process, at one point I had one of them sat on my lap as I was sewing the thing!. They are size 5 years. For the bodice, as I mentioned, I used a DK weight yarn (light worsted weight) and a size G hook (4 mm), I chain 80 chs and I joined to the first chain. Round 1: ch3 and make 1dc on each ch till end of the round, join with a sl st. Round 2: ch3,* make 1dc on each of the next 7sts, make 2dc on the next st, repeat from * till end of the round, join with a sl st.
Rounds 3 and 4: ch3 and make 1dc on each st all around, join with a sl st and fasten off. ch43 and join with a sl st. Round 1: ch3 and make 1dc on each st, join with a sl st. Round 2: ch3 make 1dc on the next st, *ch1, skip 1st and make 1dc on each of the next 2sts, repeat from * till end of round. Round 12: ch3 make 1dc on the next st, *ch1, skip 1st and make 1dc on each of the next 2sts, repeat from * till you reach the last 3 sts, decrease 2dc together and join with a sl st. Round 13: : repeat round 13, you basically reduce the whole sts by a group of 2dcs and 1ch. Rounds 14 – 15: repeat round 2. Rounds 16 -18: repeat round 1. Fasten off. I sewn the sleeves to the bodice only on the top and only half of the circumference of the sleeve, leaving the rest as it is. The dress was quite easy really. For the cape, I just divided the fabric into two, so 1 meter each, I folded the edge twice and sewn a seam all around (boy that is a very slippery fabric!) for the back panel of the dress, I measured the distance between the bottom of the bodice and the floor and added 3 inches for the seam allowance. For the front I measured the opening of the bodice in the front (it was around 11 inches for the size 5 years) and cut an A line shape around the sides. For the ‘icy’ fabric I quite literally just placed it on top of the front panel and I ran a zig zag stitch all around, leaving the bottom free, I cut around the excess fabric at the seam. Ah yes!, I almost forgot! I already have requests for Queen of the forest dresses…. Seriously??? I love these dress. Your girls are adorable!